Some photos of Gigabyte's upcoming G1.Sniper 3 motherboard were published over at VR Zone, along with details about the board's new features. 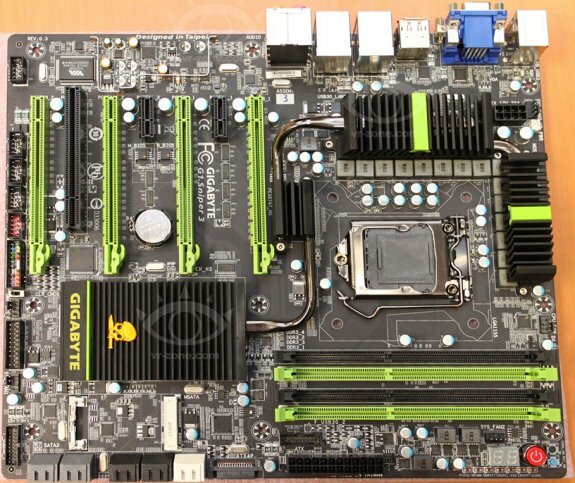 Interestingly, Gigabyte decided to use a more plain heatsink design on this board because users found the one on the previous boards too extravagant. As you have most likely already seen from the picture above, Gigabyte has really toned down the heatsink design on its gaming boards with the G1.Sniper 3 and we were told that they'd received a lot of criticism for its heatsinks on the previous boards and as such decided to go for something a bit plainer. This looks a lot cleaner at least, although we're sure that some users won't be happy with this move either..